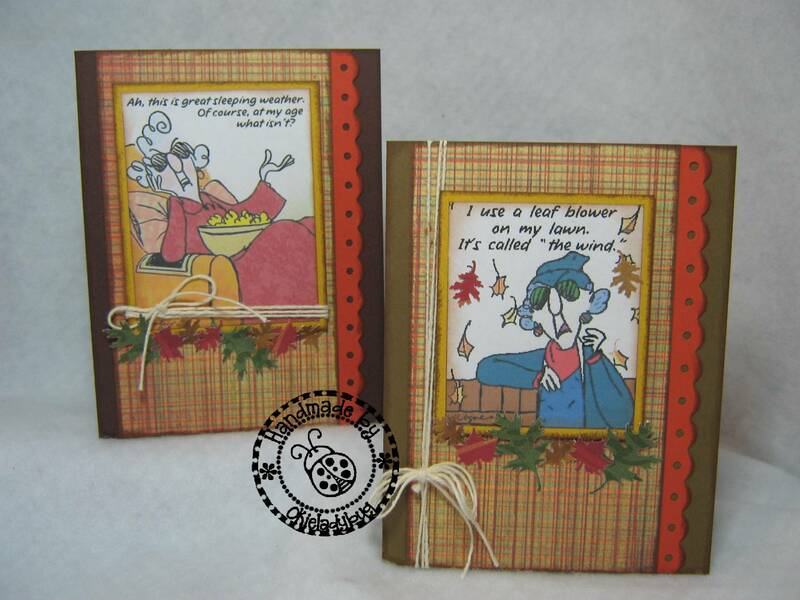 Okieladybug's Scrap N' More: Who doesn't love a good Maxine! Ya know no matter the age of a woman I think a woman always appreciates Maxine's candor about life! Last week at stamp club I got a sheet of Maxine images to make some cards with. The lady who runs stamp club is always so nice to bring printed sheets of different images for use. She only charges $1 for the laser printed ones and then she has some for free. I used several size leaf punches for the embellishments at the bottom of the images. I wish I actually owned the punches but alas...I borrowed them at stamp club! I wrapped some twine around and tied a bow with it. The border is done with the Fiskars Threading Water punch. These were super simple to make and I think they turned out really cute! Make sure you click the picture to enlarge the image so you can read the sentiments. Tomorrow I will be posting two more Maxine cards. Awesome cards! I love the leaf blower one! Maxine rocks! I can relate with these cards! They are cute but pretty! The colors are very nice! I love the fall!!! So so cute!! I just love Maxine!! Yep ... I love Maxine, so does my Mother, and my Daughter does too ... must be a female thing. *wink* She seems to say the things I wish I were brave enough to say! Love the colors of these cards, and the leaves are great too! Maxine is my hero because she really tells it like it is! LOL! My cards sure look vanilla compared to the ones you got done at Stamp Club. I put them up on my blog today too! Gotta love Maxine! Thanks Okie for another cute round of cards. Thanks for the daily smile! I'm sitting in the hospital with pneumonia BUT I CAN STILL BLOG!!!! My siter loves Maxine. It's because she and Maxine share a general philosphy of life. I would also say this to her face. LOL! Love the cards. I love Maxine! You picked a perfect image to follow your naughty princesses! Super cute, do you have a link so that we, your loyal and lovely viewers, can get these Maxine images also? Thanks! Just too preciooous! I love Maxine! I love Maxine. She is my kind of woman. Great cards. Love your cards. Have liked Maxine forever. Question-where can the Maxine images be bought or downloaded? Great job on the cards. Got to love her!